tools that allow us to find things easily our lives would be quite different and our use of on-line information and services would be far less. So when a new type of search appears we should take notice. I was browsing news on my phone yesterday and the BBC’s headline, “Facebook unveils social search tools for users”, attracted my attention. "We're indexing our map of the graph - the graph is really big and its constantly changing", explained Mr Zuckerberg. It is strange how serendipitous events happen. On the same day I read the BBC article I had arranged to meet with social anthropologist Kathleen Richardson (University of Cambridge & UCL) who in 2008 produced an important piece of research on social networks, “Archiving the self? Facebook as biography of social and relational memory”. (This was a project for which I arranged sponsorship). One of her key findings was, “The participants rarely interact with the majority of their Facebook friends and it is this dormant archive of relationships that hold the most interest as it provides an archive of relationships that would have dissipated without these technologies”. She commented that, "it doesn't matter how big one's network is there is a very small percentage (less than 50) of people you regularly interact with, it doesn't matter if you have 1000 friends or 150 the number stays more or less constant". "Social networks are like diaries and personal archives. They capture a relational encounter and allow it to be maintained in the absence of face to face meetings, relationships can be kept alive by being captured within these sites". This optimum seems to stem from a human limitation. So the ability to search our social database could allow us to more easily manage more on-line relationships, especially those that Kathleen describes as those “that would have dissipated without these technologies” and so go beyond our human limitations. While thinking about this I reflected on some excellent early work I had seen at MIT in the 1990’s mapping on-line interactions and comparing these with interactions in physical world. ”Visual Who: Animating the affinities andactivities of an electronic community”. She says in the paper, "The goal in building Visual Who was to find ways of making a community's complex and shifting patterns perceivable and legible". "Electronic communities are growing quickly in size and importance: telecommuting and virtual offices are changing the structure of corporations; online discussion groups are increasingly influential. Yet these communities can feel abstract and shapeless. One cannot tell, at a glance, who else is around. Nor is it easy to sense how the community is structured: which people share similar interests or responsibilities, how do the various circles of acquaintances relate?" 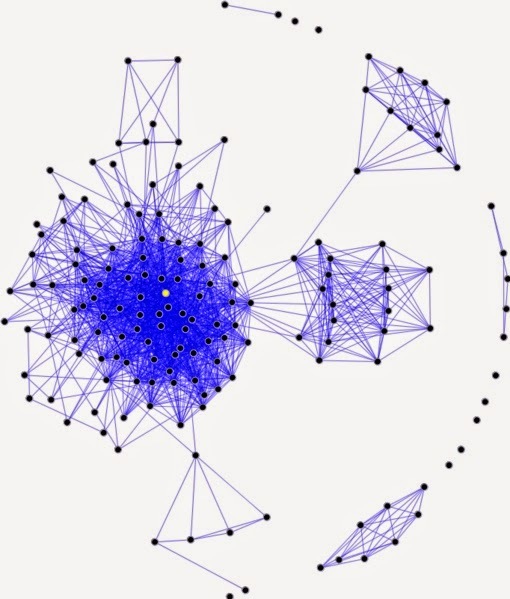 In 1999 she published further research where she examined how patterns such as bursts of activity, the arrival of new members, or the evolution of conversational topics could be visualized (“ Visualizing conversation “ ) and so produced “social graphs” for on-line services. Her latest research includes, “Mapping Social Networks”. She says of our social network connections, “If we could see a map of all these connections, stretching around the globe, we would see that a giant network of acquaintances links almost the entire world. Hundreds of years ago, this was not true; there were many isolated tribes and villages. But a century of mass migrations, missionaries, airplanes, road-building, and telecommunications have woven the world into a giant social web”. In 2007 I published an article entitled, “Is the Web the ultimate social network”? Back then I wrote, “At the end of the day, humans are social animals who enjoy communication and interaction. Social networking applications tap into this, and we will have a richer experience if we can harness these applications to enhance both our social and business lives”. With todays vast social networks, some of which encompass over a billion people, if we add the ability to intelligently search we could see ourselves being released from a limitation to human capability that we have endured for millennia and a new simplicity of interaction may result.